Instrument Drive - part of the Porch Sale at Treasures from the Point and Family Pyrate Day in Old Algiers Point, in partnership with Confetti Kids. Hungry for Music has contributed to Louisville’s musical programs through donations of drums and other percussion to The Louisville Leopard Percussionists, River City Drum Corps and others. Big Bertha, the Magic Music Bus, will complete its U.S. tour in the city with a Staple Singers tribute concert and instrument drive on Thursday, July 27, at Tim Faulkner Gallery in downtown Louisville. 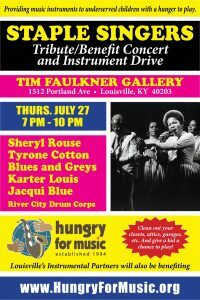 The show also will benefit RiverCity DrumCorp, which is performing that night, and Louisville Public Media’s Instrumental Partners program, through an instrument drive to be held at the concert. We'll support the local Blues for Kids program. A donation of $10 is suggested as admission to the concert, which will include performers such as Sheryl Rouse, a gospel group, Blues and Greys, Karter Louis, Bryce Gill and Daniel Jackson (of The Tunesmiths) and other musician friends (check back for more lineup details). "When a child plays an instrument it gives them a healthy challenge, builds a sense of community and opens new possibilities of self-expression," said Sara Soltau, Louisville Public Media's education programs manager. "We're proud to be the organization that connects the generosity of our community with the music of our schools." 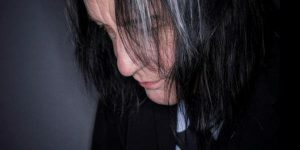 In conjunction with his performance on December 13 at the Stefanie H. Weill Center for the Performing Arts, Todd Rundgren’s music education advocacy program, The Spirit of Harmony Foundation (SOHF), is partnering with Cascio Music, the Kiwanis Club of Greater Sheboygan, the Weill Center, and Hungry For Music (HFM) to collect new and used musical instruments for children in need. Please join us in support of your local food bank by bringing a donation of non-perishable food to the concert. 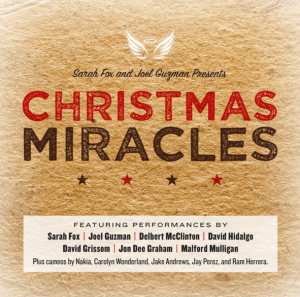 Christmas Miracles CD Release Party Hosted by Sarah Fox & Joel Guzman featuring Jake Andrews, David Grissom, Malford Milligan & many more! Click HERE or HERE for more information and to order event tickets. The 23rd Hungry for Crawfish will be held on May 12! Tickets on sale now. What? 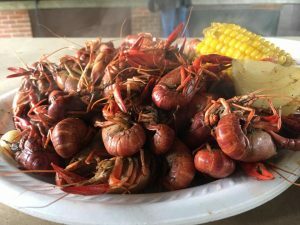 2018 Hungry For Crawfish , 23rd Annual Crawfish and Music Fundraiser benefiting Hungry for Music. When? Saturday, May 12, 2018 - Noon til 5 pm. Rain or Shine. How Much? $50.00 - All you can eat crawfish, potatoes, corn, and bread. Beer and soda served. Tickets are advanced sale only by May 6th or until Sold out. The 3rd Rock and Roll Hall of Fame Instrument Drive and Showcase Concert will be held on Saturday, June 2. Several programs that HFM supports in Cleveland and other U.S. cities will perform. Stay tuned for more information. The event is listed HERE. 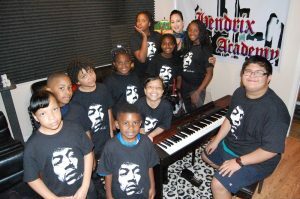 Please help the Hendrix Music Academy in Renton, WA with travel expenses to the Rock and Roll Hall of Fame and give the kids an experience of a lifetime by going to their Go Fund Me page HERE. 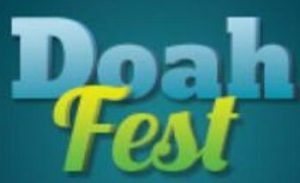 Doah Fest is a four-day celebration held on a private farm between the banks of the Shenandoah River and the Blue Ridge Mountains. Doah is more than just a music festival. 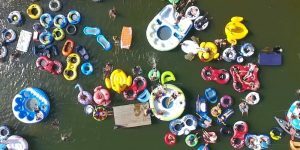 It is a chance to unplug and connect, to share possitivity and happiness with a community of beautiful and optimistic people. 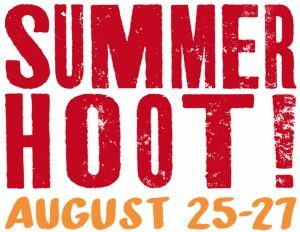 A 3-day music festival at The Ashokan Center in Olivebridge, NY (20 min from Woodstock.) 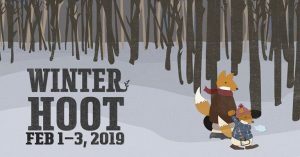 A down-home, multi-generational celebration of live roots music, local food & crafts, and the joyful spirit of this amazing community where the Catskills meet the Hudson River Valley. Click HERE for more information. 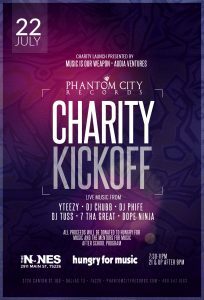 The purposes of the weekend are to enjoy great music and fellowship, to increase awareness about music education advocacy, to raise funds for the Spirit of Harmony Foundation at our House of Blues Benefit Concert, and to collect new and used musical instruments for distribution to children in need. 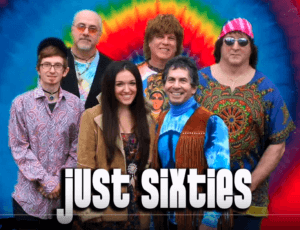 University of Notre Dame, South Bend, Indiana, September 7, 8-10 p.m.
DeBartolo Performing Arts Center concert by Todd Rundgren, backed by his full band and with appearances by Notre Dame student musicians. Optional roundtrip transportation from Chicago via chartered bus. To purchase tickets: Notre Dame Concert ticket sales go live at 12 noon Eastern Time on August 6, 2018. This promo code gives Spirit of Harmony supporters a two-week headstart to purchase their tickets in the first four rows of the DeBartolo Performing Arts Center. 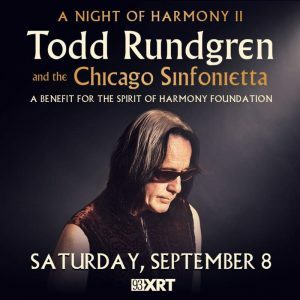 Chicago House of Blues, September 8, 8-10 p.m.
Todd Rundgren and the Chicago Sinfonietta will perform a benefit concert for Todd’s Spirit of Harmony Foundation at the Chicago House of Blues. Orchestral arrangements of music spanning Todd’s 50-year career will include hits, rarities, fan favorites, and some surprises. Rich Daniels of City Lights Orchestrawill be Conducting. In addition to the Sinfonietta, Todd will be performing with his touring band, featuring Jesse Gress (Tony Levin Band, Mahavishnu Project), Kasim Sulton (Utopia, Meatloaf, Joan Jett, Blue Oyster Cult), Prairie Prince (The Tubes, Jefferson Starship), and Greg Hawkes (The Cars). Visit resource tables for local youth music programs (in the HOB lobby). This concert is made possible through the generous support of Live Nation, Alchemedia Productions, Rich Daniels, and the Chicago Federation of Musicians. Tickets go on sale at 10 a.m. (Chicago time) on Monday, July 23. No pre-sale. No pre-sale codes. First-ever public performance of the INTOXICATS. : Originating from Kauai, Hawaii, Intoxicats were born of a rum haze one steamy summer night at Tiki Iniki. Picture Gilligan’s Island with access to MTV, Get Smart, Hawaii 5-0 and I Dream Of Jeannie re-runs, coupled with an unlimited bar tab… You get the picture. Wild Hawaiian, Vacation, or Vintage wear encouraged! Opening act: Young musicians (beginning at approximately 5 p.m.). Martyr’s is a legendary venue for up-and-coming, cutting edge talent, on the north side of Chicago. Cash bar and pub-style menu. 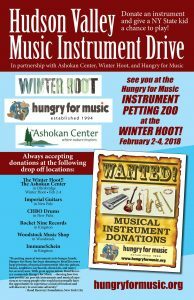 Bring your instrument donations to the Hungry For Music RV, “Big Bertha” parked directly in front of Martyr’s at 3855 N. Lincoln Avenue, Chicago from 3-6 p.m.
We will accept musical instrument donations in any condition, but we DO NOT accept upright pianos or organs. We prefer instruments in playable condition but all donated instruments are welcome. In order to get an official tax deduction, donors MUST affix their name and contact information to the instrument. If you have instruments to donate at this Chicago Instrument Drive, but cannot deliver the instruments to Big Bertha on September 9, please contact us to work out alternative arrangements. 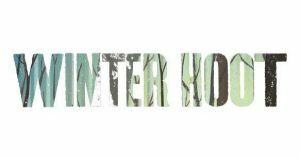 Proceeds will benefit four local music-based organizations including Hungry for Music. October 31st, 2018 from 12 noon until 1 pm. 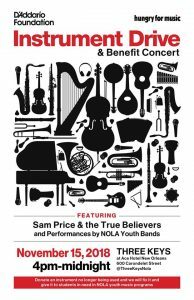 Proceeds and instruments collected directly benefit New Orleans youth music programs. Noon til 5 pm, rain or shine. 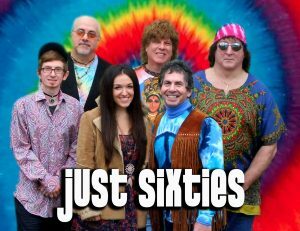 A 3-day music festival at the Ashokan Center.